Complete a 30-day challenge and change your life. This list provides 12 possibilities in the areas of spiritual, physical, emotional, and learning. It seems like there are a variety of 30-day challenges to introduce you to new ways of doing things. A 30-day challenge of any kind has several advantages. Thirty days is enough time for something to potentially become a habit. 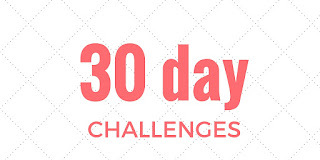 Thirty days is not a life time, so you can try a challenge and discontinue it after the 30 days, if desired. Below are twelve challenges that I have either completed or would like to attempt at some point in the future. These challenges span the four main aspects of life: spiritual, social, mental, and physical. Each of these challenges should be done every day for thirty days. If for some reason you miss a day, don't give up; start back as soon as you can. Challenges completed for 30 consecutive days are meant to challenge you. Select one of these challenges that may be a new activity. Commit to doing it every day for the next 30 days. 1. Write 500 words. You can write about anything, but the key is to write without editing - just write. I learned about a writing challenge, My 500 Words, from the author Jeff Goins. I started this challenge in January, 2015. Somehow I reinterpreted the challenge as writing 500 words per day for 120 days, so I ended up writing over 60,000 words. 2. Write out a Psalm. I completed this challenge in 2012. I wrote out (by hand) a Psalm from the Bible every day. The Psalms are a good source because they are inspirational, usually short, and there is a large variety from which to choose. I selected the Psalms prior to starting the challenge. 3. Complete a 30-day plank challenge. The planking exercise consists of holding your body stiff while resting on your forearms. You can read more about the planking challenge at 30 Day Fitness Challenges. 4. Take a photo every day and upload it to Instagram or Tumblr. Most of us probably think of Instagram as a place to upload pics and write a brief caption. However, I have seen more and more posts with long descriptions and stories. Read about this approach at Nieman Storyboard. Three excellent sites for photo challenge ideas are: FatMumSlim, Expert Photography, and The Idea Room. 5. Create a video every day and upload it to YouTube. I learned about this via e-mail from one of the many entrepreneurs I subscribe to. Many tips are provided on the 30 Day Video Challenge, but you don't have to join ($177.00) in order to benefit. 6. Read the Bible for fifteen minutes. If you are not familiar with the Bible, start reading at Psalms or Acts. Beyond physical Bibles with pages, numerous apps exist that feature a variety of translations and features. 7. Drink only water. The Mayo Clinic recommends about 3 liters of total liquids per day for men and 2.2 liters for women. A number of variations exist, ranging from the classic 8 cups (64 ounces) per day to calculations based on weight. The key for this challenge is that you should only drink water: no tea, coffee, juice, or alcohol. 8. Do a random act of kindness. Reaching out to help others also helps us individually. For this challenge, be aware of the activities going on around you and find a way every day to ease someone's burden, whether that is holding the door open or giving up your parking space or feeding the homeless. The Random Acts of Kindness Foundation has a great list to give you some ideas. 9. Learn a new word. Increase your vocabulary by learning a new word or phrase every day. The Merriam-Webster dictionary, both online and the app, feature a word of the day. For maximum learning to occur, write out the definition of the word. 10. Memorize a Bible verse that is new to you. There are many promises, inspirational passages, and guidance for life in the Bible. Search for some of these yourself or start with an online list. 11. Single-task at your desk. The opposite of multi-tasking, which scientists suggest is really a misnomer, single tasking means doing one thing at a time. Clear everything from your desk except the barest of essentials: a computer, if needed, a planner, and writing utensils. Bring out whatever resources you need to accomplish a task, but then clear those resources before starting the next task. 12. Walk 15 to 20 minutes. If you don't have a regular exercise program, this is a great start. Beyond the benefits of physical exercise, gives you an opportunity to stimulate your brain for better thinking and lets you take a mental relaxation break. Stepping away from a problem may provide a catalyst for problem solving. Create a record in a journal, on a whiteboard, or on your computer so that you can track your progress every day. At a minimum, record whether or not you completed the challenge each day. If the challenge is quantifiable (e.g, minutes or distance walked, number of words written, ounces of water consumed), record these measurements as well. This will allow you to review your progress and see what is possible in a brief period of time. 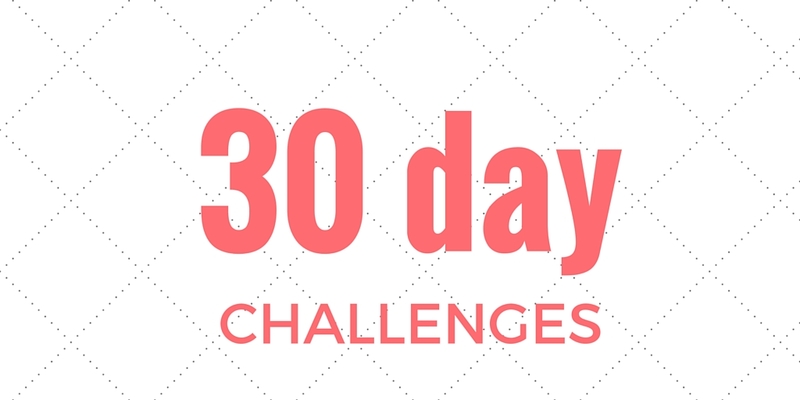 Have you started any 30-day challenges? Have you completed any 30-day challenges? What helps you get from the start to the finish? If you would like to commit to one of these challenges, use the link below to sign up. I will send you a couple of encouragements during the process and follow-up with you at the end. Yes, I commit to a 30-day challenge!